Memorizing different types of password for different devices is really an inconvenience job. Say goodbye to this problem and take Hideez key. Well, this is a kind of digital key that works as a password manager, can unlock any device of yours and most importantly help you to find your key. It can unlock any devices including the computer, mobile as well as websites. This digital key is so helpful, but what is this digital key? WHAT DOES DIGITAL KEY MEAN? DO YOU NEED TO SECURE YOUR INFORMATION? HOW TO USE HIDEEZ KEY? Basically, a digital key is a portable, compact device that has the ability to enable its owner to authentic the access of a website or any device. In addition to that, it can store other passcodes, encryption keys, and other personal data apart from your device. Also, it can store any one time password, and if required, it can encrypt any data as well. So now you know what digital key is. Well, then what are the jobs of the Hideez key? I mean in what purpose you can use it? Just like any other digital key, you can use it for locking or unlocking your phone, pc or tablet. Moreover, you can store any personal data, or passcodes or any other credential of websites or app. This will allow you to separate your date from the main device physically so that no one can hack it. Other than that, for two-factor authentication, you can generate a one-time password on your most favorite apps or websites. Choose the highest level of the complex password and forget about this. But that is what all digital keys do. What are the special features of the Hideez key? Well, a software is needed to get some more features. You can download its app. does it only support on android? Not at all. It also supports IOS, your windows pc or Mac. And when you will use it with your android phone, you will get these features. You will have the location of the Hideez key. That means if you attach your other keys, pen drive with the Hideez key then you can locate them if they are lost by any chance. And the best part about the Hideez key is that you will get the notification if you are going to lose your key rings. How? Actually, when the Bluetooth signal strength will fall below the standard, you will get a notification on your phone app. You can authenticate yourself with the most advanced eye vein scanning technology. In addition to that, you can snap the pictures of unauthorized users. 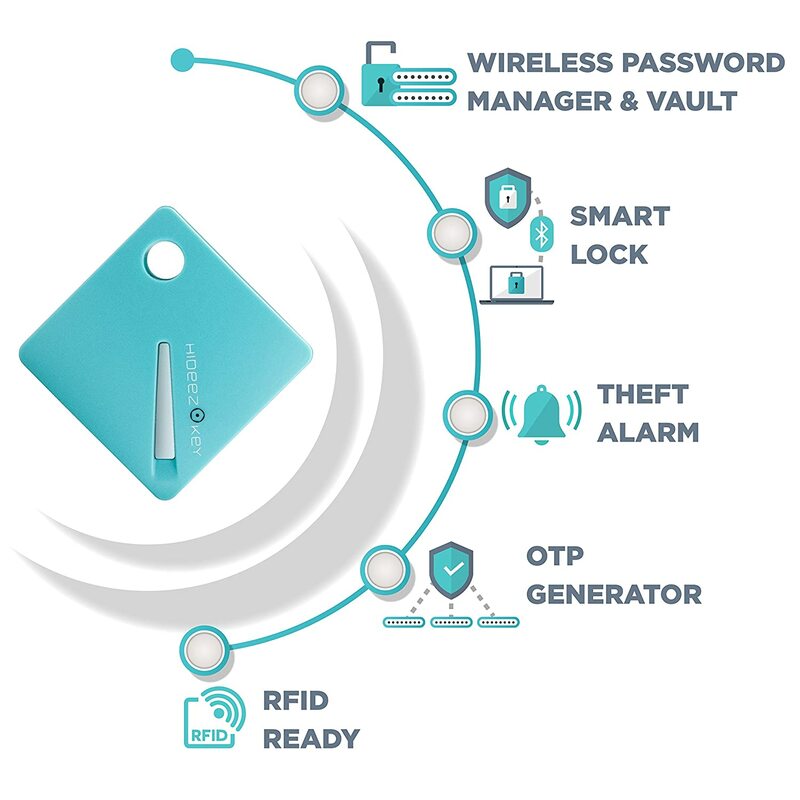 The Hideez key use RFID sensor. This sensor inside the Hideez key consists of a unique passcode of your RFID enable door lock system. This will help you to lock and unlock your door with this digital key as well. Isn’t it awesome? If you need to send your location, you can do that. You can send your location to a predetermined mobile number. You can run the script on your phone for controlling the camera as well as other functions. And lastly, if you lose your Hideez key by any chance, you can remotely block your key. You can use another Hideez key as well to create a backup of your Hideez key. That means you are secure with this key, no matter you lose your phone, pc or you leave it in your room, or even you lose your digital key. Well, you will get these so many features. But do you need these/ do you even need to secure your phone or pc or website information? Just think about it. You have lost your phone by any chance and you do not have any password. That means the person who gets the phone will have the full access to your phone. What can happen if he/she gets all of your mobile information? He/she will get your contact list, social media access, and other buying account access (for example, online shopping). He/she might get your personal photos or your family photos as well. All these things he/she can use against you. How? He can use your buying account and buy anything he wants. He can post any sensitive photos from your social media accounts and also he can use the contact information to blackmail you. The same thing can happen with your pc as well. Even if you do not secure your favorite website account, there might be a chance that someone will access there and can do anything that you should not do. Maybe you think that you do not go outside with your laptop or desktop. But let me tell you something. There still be a chance that someone will enter your room/office and use your pc to do unwanted things. You may use a strong password and password manager for solving these problems, these will not be as convenient as the Hideez key. When you will unbox it, you will see a 1-inch square coin type key. This looks a little bit funny. There is a hole in that one-inch device so that you can attach it to your key ring. A battery that is inside the key. That means it is readymade. You will find a grey panel that is right at the middle of this key which is actually a button. The button is covering a LED light. This light glows based on the status of the key. Also, there is a beeper inside the key. Though you will not find the user manual, however, you will get a QR code. Scan the code for the app and user manual. Also, you will get the manual on their official website. Well, you get it. How will you use that? The first thing you will need to do to use the Hideez key is to download the app. I have said already that you will get the app when you scan the code. The key works with Android 4.4 version and so on, IOS, macOS, windows 8.1 and so on. When you open the app, you will see get started button. Click here and you will be redirected to a sign-up page. Fill all the information and sign up. You need to confirm the email. After confirming, you will need to allow the access of the app to your device’s location. Once you are done with this, simply press the button on the Hideez key and it will take just a moment to sync it to your new app. To set the password, click the “my password” option and you will see various options. From here, you can generate a one-time password. Also, set passwords for your device and websites as well. It is simple and easy. The next thing you need to do is to set the theft alarm so that if anyone steals your Hideez key, you get the notification. To do that, simply press the ‘theft alarm’ and you will be able to set the theft alarm. In addition to these features, you will see an option named ‘more’. Click here and you will find some options that might help you secure your key. Is it tough to use? Not all. It is simple to use and anyone who has basic knowledge can use it. Overall, if you ask me should you use it or not, then I will suggest you use it without any hesitation. If you want to protect your password, want to make the lock and unlock your phone and pc, want to make it easy to lock and unlock the door, then you must have it. It offers so many benefits. It is easy to use. It can save your date from being hacked as well since it will keep your password separate from your original device. So, just take it and forget about the password issue.